Raif Badawi, born on the 13 January 1984 in Saudi Arabia, is a writer and an activist. He is married to Ensaf Haidar and has three kids. He is the creator of an online blog called Free Saudi Liberals. Raif used this blog to voice his opinion about what goes on and about the laws that are set in Saudi Arabia. According to critics,He used this website to insult Islam. In 2012, Raif was arrested for creating a blog that broke Saudi Arabian strict electronic rules including being charged with apostasy;when muslims question any of the laws of Islam, for example the Sharia Law or someone who had insulted Allah, but this charge was later cleared in 2013. According to The Guadian, his website was forcibly shut down shortly after he was arrested in 2012. Raif was first sentenced to seven years in prison and to six hundred lashes but was resentenced in 2014 to ten years in prison and one thousand lashes. Amnesty International has sinced called him a “prisoner of consciousness” ; a term used to describe anyone that was sentenced to prison on a basis of race, religion or political views. It can also refer to someone who was sent to prison because of expressing their human rights in a peaceful manner and also standing firm to what they believe in. The flogging of Raif Badawi has caused a stir and has had people standing up and supporting him from all over the world,saying that his punishment is unnecessary and of an unfair nature. 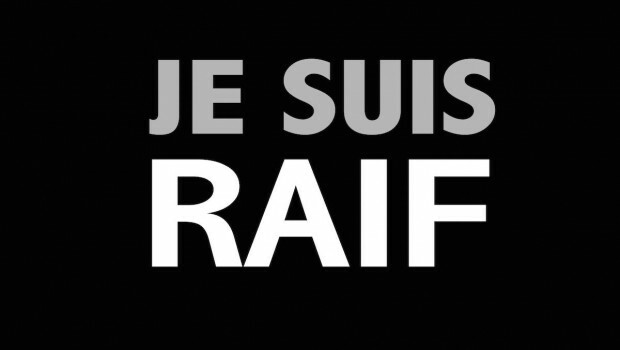 Blogs, forums and Facebook pages has been started, demanding the freedom of Raif Badawi. So what does Freedom of speech look like if that when you raise your voice and do something about the way feel, you are punished in such an extreme manner? This should be a reason for you to question everything that happens and everything that goes on in Our world. Don’t be like dead fish and go with the flow. You were made to stand for something that you believe in, Use your voice!